White Nexus S heading for AT&T | Android Blast! test The white Nexus S wil appears to be heading for AT&T. 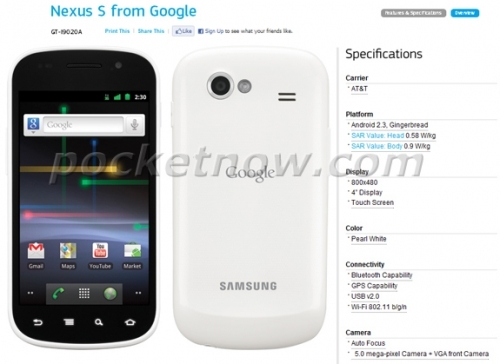 The white version of the Nexus S was spotted on Samsung's website, but then the page was subsequently removed. AT&T was suggested as the carrier. PoketNow notes "this version of the Nexus S goes by the model number GT-I9020A instead of SGH-Ixx7 as would be expected from a Samsung smartphone sold directly through the carrier." No official price or release date is known, but Best Buy is selling T-Mobile's Nexus S for $99 on contract, so we're assuming AT&T will come in at the same price.